This one is tuned to Eb which of course does not mean an open tuning but one half note lower than standard tuning, something Jimi Hendrix or Stevie Ray Vaughn did to get a fatter sound without having trouble with playing techniques like string bending. Probably with 009 string gauge again (confirmed for the Kill to get Crimson tour), with a wireless camera mounted on headstock. This one has a comparatively light rosewood fingerboard. 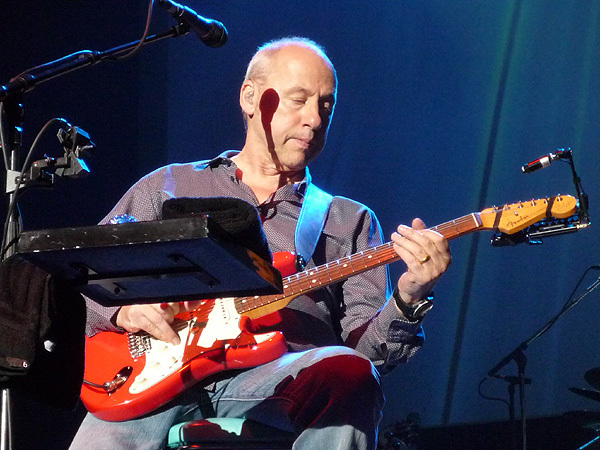 On the 2008 tour he played these two songs on Glenn Worf’s MK signature Strat, which has a lighter, more orange colour. This might be the same guitar again. Romeo & Sultans: Glenn Worf's guitar? 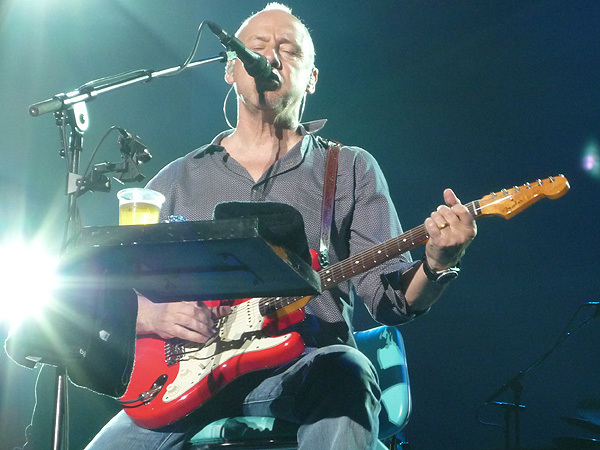 On some gigs he played the ’54 Stratocaster, but seems to use another MK signature with heavy strings (wound g string) now. Easily to recognize on pictures because of the narrow guitar strap. One of Mark’s signature Strats has the serial no SE 00001, but I cannot tell for sure which of the four guitars this is. The one on So far away has a nice slightly flamed headstockk, but the flame/grain pattern seems to be different than on the 00001 Strat. Maybe it is the one on Border reiver? I am looking for good pictures of guitars #1 and # 2 to contrast them all here. If you have any, please send them to me so that I can put them into this post. ⟵Which songs of the Get Lucky tour are played with the Tone King Imperial? And what was the amp setting? 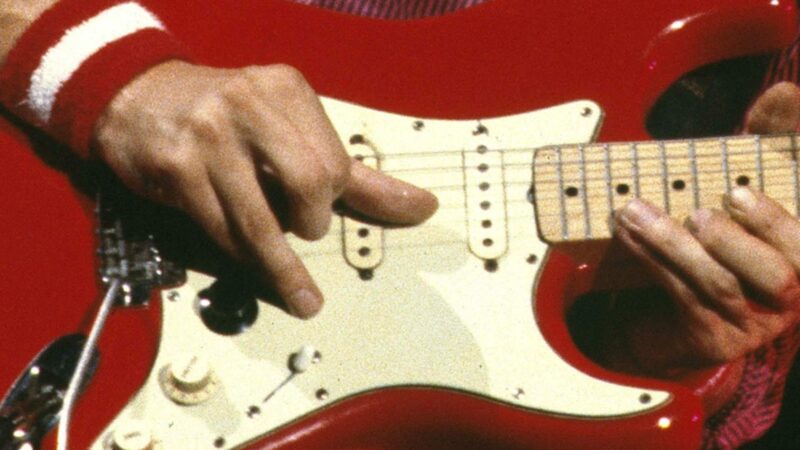 I think, Mark may use 3 “normal” Sig Strats with his signature on the headstock and one without any signature (like he was using on Princes’ Trust Concert or during interview with Phil Cunningham). Don’t you think so? On Princess trust, he used the prototipe, the same guitar that MK Siganture but without signature on headstock. He plays this Fender on AOL Session 2002, on Wild theme. Since 8th april, I’ve resisted to visit most of Mark’s sites to not be spoiled with any infos about the setlist ! When I saw these articles about guitars here, I closed quickly my navigator and I managed to hold up today ! Yesterday, he played it on the sig strat. I only had the chance to watch the Hamburg concert (16/06/10), but there’s a really cool guy from Israel (Isaac Shabtay, living in Canada) who follows the band by bus, train, plain or otherwise during the *entire* (US and Europe) Get Lucky tour…plus writing a rather exhaustive blog about his experiences and in much better details on *each and every gig* than the blogging band members. Great fun to read and from a different point of view than Guy oder Richard. By now, he can tell even subtle differences in the solos and would have been a great source of information guitar-wise…but as he occasionally makes notes to chord progressions and writes about subtle differences in certain solos on his own- why not try to ask him about some details, eventually?